Paint correction is the art of transforming cars into glass mirrors and really is the only way to remove swirl marks and paint flaws from car paint. Especially with black car paint. 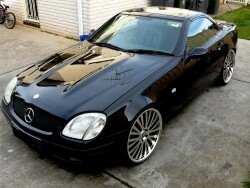 At Dr Buff car detailing, we provide some of the best paint correction treatments in Sydney. 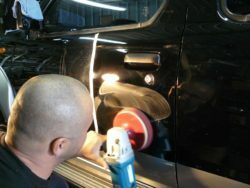 There are lots of auto diy techniques you can find online but nothing beats the hands of a skilled paint technician who can wave a buff over paintwork like a magic wand and as Meguiars certified detailers, that’s exactly what we do. At Dr Buff, we have paint correction that starts from stage 1 and goes to stage 3 with the cost varying for each treatment. Have you ever wondered how to remove swirl marks from black car paint with paint correction ? or even white car paint ? Highly skilled machine polishing which involves actually restoring car paint with buffers, that’s how. This is what exterior detailing should really be but unfortunately by most it is not carried out this way. I often get the question ” I have swirl marks on a new car, how do I remove scratches or swirl marks from car paint by hand ” and the God’s honest truth really is that the only way you can safely remove swirl marks on car paint is to machine buff car paint. Why Do I Need To Machine Polish Car Scratches Instead Of Hand Polish ? Although you can hand polish with most polishes manufactured today, when it comes to removing scratches or swirl marks by hand, it becomes a rather arduous task. The Reason I stress that machine polishing car paint is better and more effective is that machines provide speed which assists in breaking down compounds and polishes which aids in restoring car paint as fast as possible to the highest possible shine. What Is The Difference Between Car Detailing and Paint Correction ? Car Detailing use fillers or in many cases three in one compounds which contain some abrasive, some polish and polymer sealers. To detail a car is to purely enhance the overall appearance of the vehicle in question. Paint correction is always single stage passes, the only way to remove light scratches or swirl marks from auto paint with buffers and to actually restore painted surfaces on a permanent basis. These are the differences. If you’ve ever been in the situation where a car detailing specialists has left your car with swirl marks after polishing a car, then you have dealt with a poor car detailing individual. What Are Detailing Compounds And Can They Remove Swirl Marks ? Primary compounds for detailing purposes usually consist of three bases. A slight cutting agent, a polishing agent and a paint protection agent. It’s what I like to call a mild abrasive polish which cuts and polishes at the same time while also adding some paint protection for restored paint as well. This is only meant to remove only very light swirl marks form car paint. It is not paint correction. The primary purpose is to complete this phase within one pass. Usually though three in one products don’t always cut as deep or as fast as a single pass product. This is the reason why cheap detailers always choose cutting compounds over other compounds, because they just cut fast and deep but also leave a trail of destruction.. Hence why they leave swirl marks and also remove huge amounts of paint. These are the reasons why they don’t complete the entire process When you have to add more passes, it is no longer really detailing, it becomes complicated and no longer cost effective. 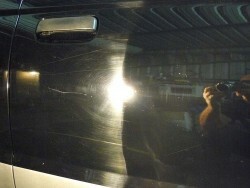 Paint correction on the other hand is what is known as the professional level of car detailing. This is an entirely different approach to car detailing. With actually removing swirl marks and light scratches from car paint with buffers, everything is accomplished in stages using single base products, from the cutting compound right through to the finishing compound. We use Autoglym, Meguiars, Mothers, 3M, Menzerna and more so we never run out of choices. Hence why the procedure is much more effective. Removing swirl marks and light scratches or even deep scratches from car paint can only really be done with paint correction. It is everything from car washing to clay barring for removing paint contaminants, to car polishing and to the final stage of car waxing which keeps your car looking like a rolling polished mirror. The results however are really something which leave you speechless and not wanting to drive your car. I’ve heard the words “THE CAR DIDN’T LOOK LIKE THIS WHEN I BOUGHT IT NEW” quite a few times let me tell you.These are results that last. They are an actual restoration of your surfaces. It is a permanent fix. How long that fix lasts depends on your care and what steps you take to maintain it. If by any chance you have a vehicle which does have severely damaged paint surfaces, and you have been informed that your vehicle will need a paint re-spray, please see us first.